Amidst the event saturated month of Archtober and the holiday hubbub that followed, the Center for Architecture‘s fall show, Buildings = Energy, got a bit lost in the shuffle. But there’s still time to check it out through January 12. Earlier this month Margaret O. Castillo took AN on a tour of the exhibit, the last under her tenure as AIANY chapter president. The show drives home several green points that Castillo has been hammering at all year, primarily the fact that buildings consume energy–a lot of it. Eighty percent of greenhouse gas emissions come from buildings, and in New York City alone they use 94 percent of the power. The exhibit takes a holistic approach focusing on the amount of energy needed to extract and make materials, to the energy used to build, and the energy consumed by the completed structure. Rings the width of oil barrels hang in the window. On each, figures spell out the surprising amount of oil needed to produce various materials. Here, one gallon yields 3.33 cubic feet of lumber. The story begins in the front window with calculations of how much oil it takes to produce a typical building material. Suspended from the ceiling are aluminum, cinder blocks, lumber, bricks, and sheetrock. 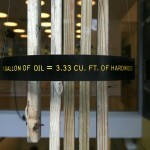 Each material has a barrel ring floating around it with figures printed on them, such as: “1 gallon of oil = 3.33 CU. FT. of hardwood.” The calculation includes the energy to fell the tree, transport it, and cut it to size. The Mayor’s Office of Long Term Planning and Sustainability, ARUP, and Dattner Architects lent their expertise to arrive at the various figures found throughout the exhibit, lending the heft of real world numbers to the theoretical aspects of the show. 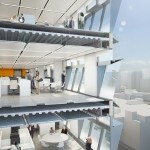 The main theoretical voice comes from Perkins+Will in a section of the exhibit called One Building = Many Choices. 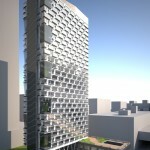 Through a series of renderings the firm explores key factors from building concept to completion that include: Site Choices, Program Choices, Passive Systems Choices, Active Systems Choices, Materials Choices, Construction Choices, Operational Choices. Each section is deserving of in depth analysis, but the Passive System attracted our attention because of the design of the building’s envelope, about which the team from Perkins+Will had the luxury of dreaming big without a client screaming “How much? 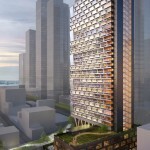 !” Thus an elaborate customized photovoltaic facade zigzags down the face of the building. It may cost upfront, but the returns are obvious. 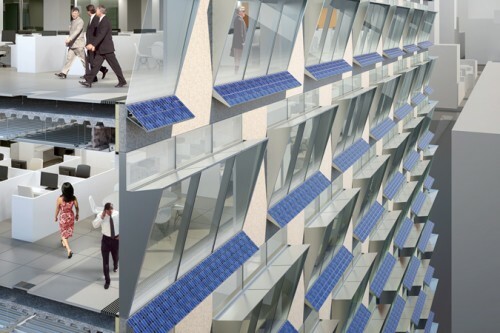 “I’m imagining the day when buildings will produce energy, not use energy,” said Castillo. Anthony Fieldman, design principal at P+W, noted that the curtain wall is “the only membrane between you and an uncontrolled environment. So if you use it intelligently you can temper nature’s forces before they become problems you have to deal with in the interior.” Fieldman added that the geometry of the facade was designed to maximize light, minimize solar heat gain, and maximize energy though the PVs. 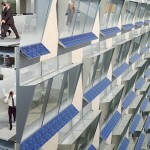 The photovoltaic facade drew questions of customized photovoltaics vs. mass produced ones. To which Castillo argues that architects should be pushing for the industry to create more choice. “We should be pushing for better looking photovoltaics, instead of just the flat black photovoltaics on the roof,” she said. Elsewhere in the exhibit, plenty of real world projects illustrate the show’s values. 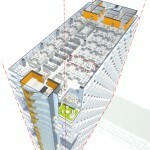 An air circulation animation produced by Buro Happold Consulting Engineers of Pelli Clark Pelli‘s Transbay Center in San Francisco demonstrates both passive and active systems working together for temperature control and air flow (see below). A model of City College’s entry for the Solar Decathlon, the so-called Rooftop Pod, is also on display. And there are several examples of adaptive reuse, including a project that Castillo worked on with Helpern Architects for Columbia’s Knox Hall. To avoid rooftop disruption, the school drilled 1,800 feet into the ground for geothermal heating and cooling. The Operational Choices illustration shows a very familiar park in forground. Hanging in the front window are the rings the width of oil barrels. On each, figures spell out the surprising amount of oil needed to produce various materials. 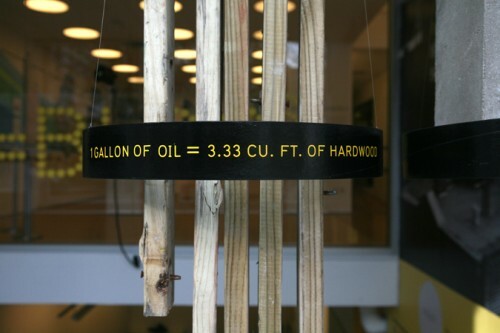 Here, one gallon of oil yields only 3.33 cubic feet of lumber.